There are several ways you can get free help and support from me. 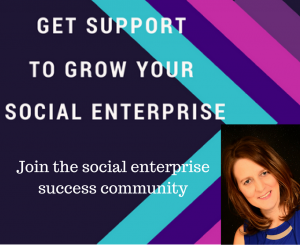 As part of the work I do with social enterprises and social entrepreneurs I have recently set up a Facebook group – Social enterprise success so you can get access to more support. The purpose of this group is to support social entrepreneurs – from the start-up stage, through to growth and also succession. By joining this group you will be able to connect with other social entrepreneurs, share experiences, ask for and give advice, receive access to technical and how to webinars on a range of topics, and most importantly grow your skills and expertise as a social entrepreneur. If you need further advice I offer free 20 minute success calls – which you can book via my bookings page. These calls are for you to get help with any social enterprise issue or question you have. You can also use the calls to look at any personal blocks or beliefs that are holding you back from growing your social enterprise. Finally, if you aren’t signed up to receive my e-newsletter and updates please sign up now – as you will get to hear about any free resources and events I am running first.